This week, some of the Centre’s most highly qualified and experienced marine ecologists are embarking on a voyage to better understand the health of isolated reefs inhabiting the Coral Sea Marine Park (CSMP). As part of a larger three year project, researchers, led by Prof Morgan Pratchett and Dr Andrew Hoey, will cruise from Port Douglas in far north Queensland to Horn Island in the Torres Strait. Over the two week journey, the researchers will conduct extensive surveys of some of Australia’s most remote coral reef atolls including assessments of coral and reef diversity. 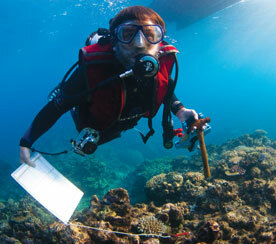 This information will provide a clearer picture of the current condition and resilience of CSMP reefs. It’s well-known that in 2016 and 2017, coral reefs in the Great Barrier Reef Marine Park were impacted by back-to-back mass coral bleaching. Likewise, even remote reefs in the CSMP were not isolated from the impacts of marine heatwaves. The data collected by our team, provides a valuable resource for marine park managers, especially as the frequency of bleaching events is predicted to increase over the coming years. The research team heading off to sea includes (L-R) Prof Andrew Baird, Prof Morgan Pratchett, Dr Andrew Hoey and Dr J.P. Hobbs.